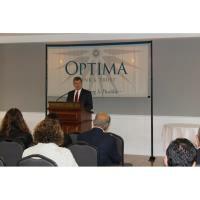 PORTSMOUTH, NH (May 25, 2018) – Optima Bank & Trust, the only locally-owned, commercial bank on the Seacoast, held the 2018 Annual Meeting of its shareholders recently at the Portsmouth Country Club. The bank’s president and CEO, Daniel Morrison, announced exceptional results for 2017 and a strong outlook for the year ahead. Morrison reported that total assets grew by a record $69 million to $496 million at December 31, 2017. In 2017, total loans grew by a record $78 million to $420 million, and total deposits grew by a record $66 million to $464 million. For 2017, net income was $1.9 million. Morrison reported that the outlook for 2018 is very positive, even better than 2017. The Bank’s total assets crossed the half-billion-dollar milestone during the period and ended the quarter at $502 million, up 15% from $438 million a year earlier. “In 2017 we built our newest branch, at 920 Central Ave. in Dover New Hampshire. The new branch opened in January 2018 and has already begun to be very successful. This full-service branch replaces the limited-service loan office that the Bank had been operating in Dover for several years. The new branch will allow the Bank to expand its presence and build more customer relationships by increasing its deposit product and service offerings in the Dover market. The Bank now has seven locations, including the corporate headquarters at Two Harbour Place, and six full-service branches,” said Morrison. Morrison praised his dedicated staff and stressed that their efforts to provide high-quality customer service to businesses and individuals throughout New Hampshire as key to the Bank’s success. According to FDIC data, Optima Bank & Trust has continued to gain more deposit market share in the seacoast region of New Hampshire than any other bank over the past ten years. Optima Bank is reported as the only bank that has significantly grown its deposit market share in this area, gaining more market share than all the other banks combined. About Optima Bank & Trust: Founded in 2008, Optima Bank & Trust is an award-winning, locally-owned commercial bank headquartered in Portsmouth, New Hampshire. With seven locations, including six full-service branches and a corporate headquarters office, the Bank's focus is on providing exceptional service to commercial and personal customers for deposit products and business and residential lending. For more information, visit optimabank.com or call (603) 433-9600. Optima Bank & Trust can also be found on Facebook, Twitter and LinkedIn.